Take a look at the data released for August 2016 from the agents’ Association of Grey Bruce Owen Sound. Some interesting numbers. 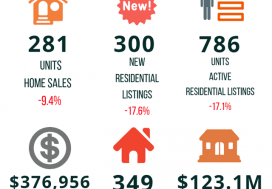 Sales and sale price were up but number of available listings was down…what does that mean for you? #1) Now is a GREAT time to offer your property for sale because there are fewer other properties to compete with. #2) If you find a property you’re interested in, DON’T WAIT to take action because good listings are going quickly! Call me when you’re ready! “Home sales (in Grey Bruce Owen Sound) numbered 358 units in August 2016, rising 36.6% on a year-over-year basis. This marked the first time that sales in any month have ever surpassed the 350 mark. On a year-to-date basis, home sales totalled 2,087 units, running 18% ahead of the first eight months of 2015. 2016 is easily on pace to be the best year ever for home sales in the region. The average price of homes sold in August 2016 was a record $266,804, up 9.4% on a year-over-year basis. On a year-to-date basis the average price of home sales in the first eight months of 2016 was $258,749, rising 5.4%. 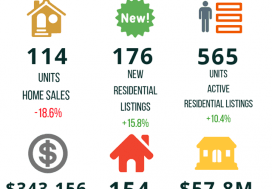 Active residential listings totalled 1,491 units at the end of August, down 40.2% from the same time last year. This was the lowest level for end-of-August active listings since 2007. The number of months of inventory stood at 4.2 at the end of August, down from 9.5 months at the end of August 2015 and well below the long-run average for this time of year. The number of months of inventory is the number of months it would take to sell current inventories at the current rate of sales activity. For more details, visit www.RAGBOS.ca and if you have any questions about buying or selling, feel free to contact me via any of the options listed below!